June 2015 – My Story – ISB and beyond !!! Heard just now that ace Carnatic musician Sanjay Subrahmanyan has been chosen for the Music Academy’s prestigious Sangita Kalanidhi award for the year! musicrux.com is a portal that gets you the latest on Indian classical music. You can get regular updates on concerts/events near you, news, educational posts and details on artists, organizations, venues etc. Online learning and many more exciting things are planned in the near future. Here is part 3 of the series I am writing on the science behind music in “Saamagaana – The First Melody“, a monthly magazine on Indian Classical Music. The intent is to help readers understand a bit more about the science behind music and musical instruments and to enhance their appreciation of the same. This is from the June 2015 issue of the magazine. Please contact the magazine for subscriptions. I see only 4 strings on a violin. How is it then that a violinist is able to produce so many notes? When a string is pressed against the fingerboard of the violin, it is held tight between the place where it is pressed and the bridge. Depending on where the string is pressed, the length from there to the bridge changes. This change in the length of the vibrating string as the fingerboard is pressed at different places produces different notes. What is the violin bow made of? The bow usually has hair from a horse’s tail (that comprise the white bottom part of the bow) held taut using a stick (the upper part and the corners). I sometimes see violinists rubbing the bow against some material. What is it? The material is called rosin. It is a resin that is collected from pine trees and dried. It makes the horse hair on the bow slightly sticky. Why is the bow required? Why can’t a violinist just pluck the strings like a guitarist? If a violinist plucks a violin string while pressing it down at some point along the fingerboard to produce a note, his soft fingertip will quickly absorb the vibration resulting in a dull, heavy sound (called pizzicato) rather than a clear note. When the bow, made slightly sticky using the rosin, is drawn across a violin string, continuously excites it. The string sticks to the bow, gets pushed forward and slips back only to be again grabbed by the sticky bow to repeat this action hundreds of times each second. The string thus gets re-plucked so many times every second and produces a long singing note instead of the dull, heavy sound associated with a single pluck. A guitar, on the other hand, has frets. When the string is pressed against the fingerboard, it is held tight between two hard objects–the nearest fret and the bridge and hence produces a clear note. 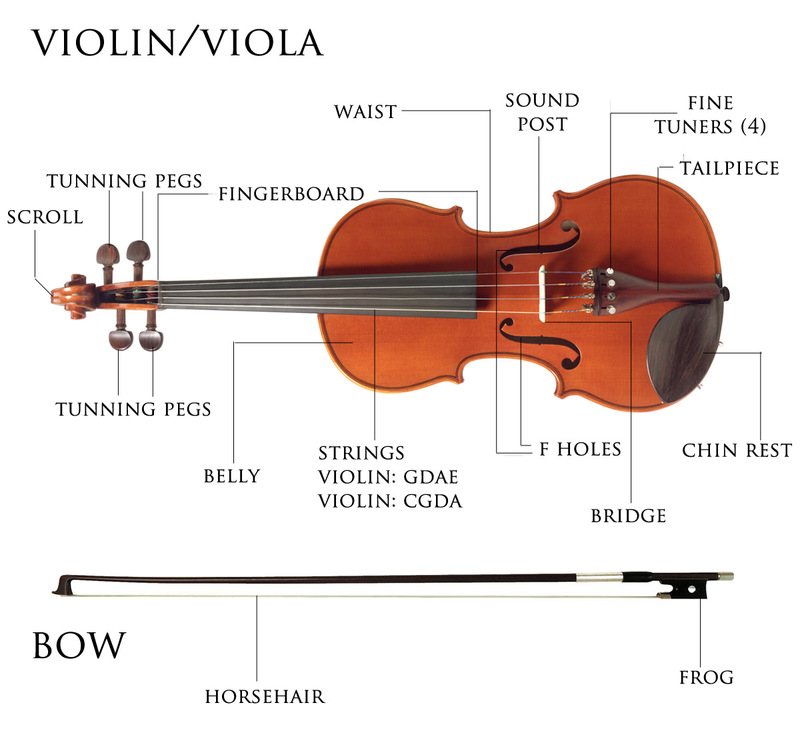 Why does the violin have a wooden body? The vibrating violin strings can hardly make any sound on their own as they are too thin and can’t push too much of air about. However, when they are attached to the hollow wooden body, their vibration is passed on to the wooden panels of the body which try to vibrate at the same rate as the string. This creates more powerful ripples in the air pressure, thus making louder sound.